Last August 6th 2012, the International Astronomical Union (IAU) approved nine new names for craters in the planet Mercury, and among those artists immortalized was J. R. R. Tolkien himself! What a great honour indeed! According to the original press release, "in keeping with the established naming theme for craters on Mercury, all of the newly designated features are named after famous deceased artists, musicians, or authors or other contributors to the humanities." The craters named are in the north polar region, since it "is of high scientific interest because of the shadowed craters there that host radar-bright deposits that may consist of water ice. All of the nine newly named craters host such deposits", says Nancy Chabbot, of the Johns Hopkins University Applied Physics Laboratory in Maryland, United States, and she states that "MESSENGER team members and collaborators who are researching this area contributed the proposed names". Additional information on Tolkien Crater can be found in the Planetary Names site. 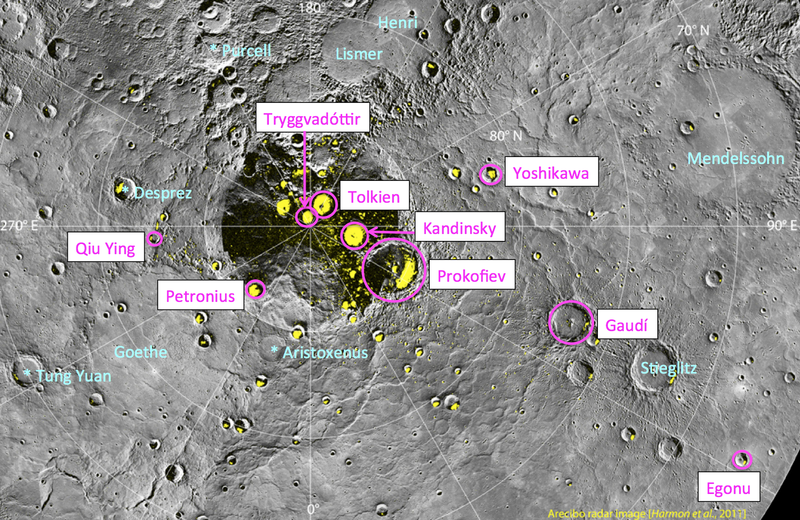 Besides Tolkien, the other eight artists who have their names on Mercury's craters, are: Antonio Gaudí (Catalonian Architect), Titos Petronius (Roman courtier, author of the Satyricon), Uzo Egenu (Nigerian painter), Wassily Kandinsky (Russian painter), Sergei Prokofiev (Russian composer and pianist), Nina Tryggvadóttir (Icelandic artist), Shifu Qiu Ying (Chinese painter) and Eiji Yoshikawa (Japanese novelist). Regarding why the craters are named after famous artists, the original press release tells us: "These latest names for major craters on Mercury are important for two reasons," adds MESSENGER Principal Investigator Sean Solomon of Columbia University's Lamont-Doherty Earth Observatory. "The first is that formal names make it easier to communicate scientific findings about specific regions and features. The second, equally important reason is that these designations expand the opportunities to recognize the contributions to the arts by the most creative individuals from many cultures and eras. The names of those individuals are now linked in perpetuity to the innermost planet." Just let me remind you Mercury is the closest planet to the Sun, so according to Kepler's Third Law, it's the planet with shortest year, hence its name! But Tolkien's crater isn't the only object outside our Earth that's Middle-earth related!! Asteroid 2675 was named Tolkien. It has an absolute magnitude of 12.5 and a perihelion distance of 1.99 UA. The JPL site has more specific information regarding this asteroid. Asteroid 2991: was named Bilbo. It has an absolute magnitude of 13.5 and a perihelion distance of 1.83 UA. You can also find more specific information about Mr. Baggins' asteroid in the JPL site. Finally, galaxy NGC 4151 is dubbed The Eye of Sauron because of it's resemblance to Sauron's evil eye. 43 million light years away, it's located in the in the Canes Venatici (Hunting Dogs) constellation, and it was first observed in March 27-29 2008. 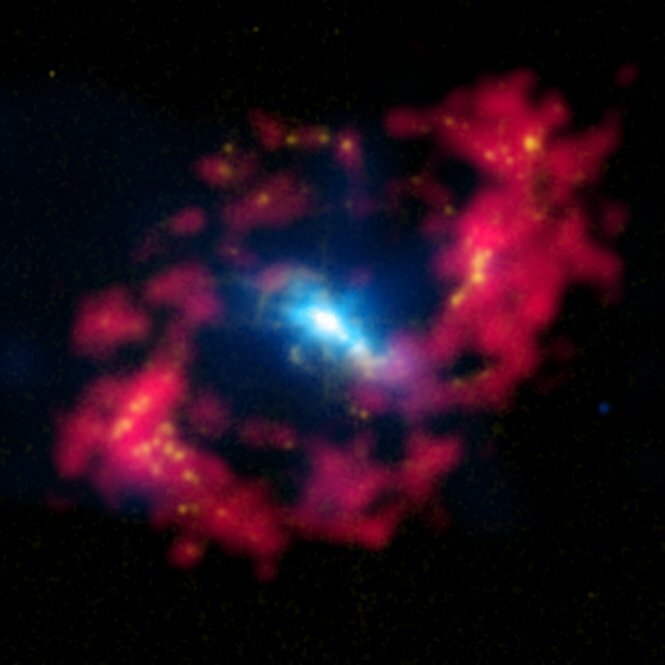 Quoting from NASA's website: "In the "pupil" of the eye, X-rays (blue) from the Chandra X-ray Observatory are combined with optical data (yellow) showing positively charged hydrogen ("H II") from observations with the 1-meter Jacobus Kapteyn Telescope on La Palma. The red around the pupil shows neutral hydrogen detected by radio observations with the NSF's Very Large Array. This neutral hydrogen is part of a structure near the center of NGC 4151 that has been distorted by gravitational interactions with the rest of the galaxy, and includes material falling towards the center of the galaxy. The yellow blobs around the red ellipse are regions where star formation has recently occurred." More information regarding this galaxy can be found at the telescope Chandra's website. So as you see, not only pubs, restaurants or even streets are named after the Professor's works, but astronomical objects as well!